Central Agricultural University, Imphal, Manipur, India. Received July 10th, 2010; revised August 24th, 2010; accepted September 3rd, 2010.
tive pathogens. 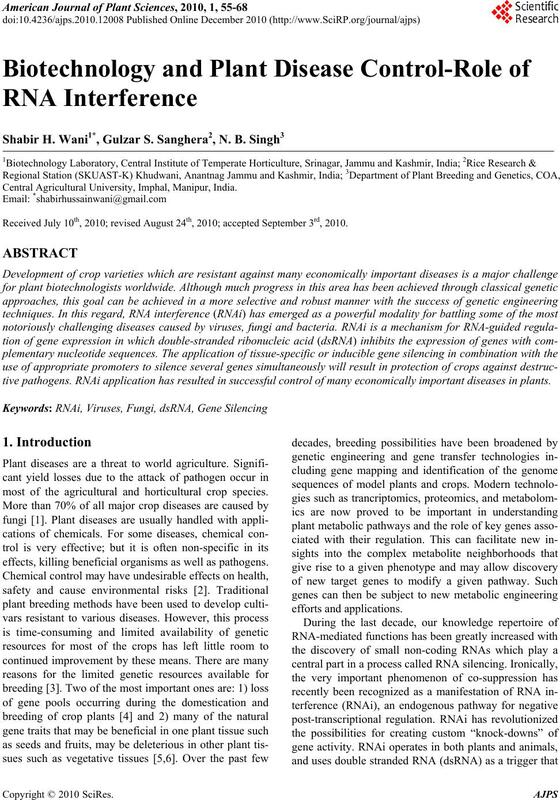 RNAi application has resulted in successful control of many economically important diseases in plants. most of the agricultural and horticultural crop species. effects, killing beneficial organisms as well as pathogens. quences or RNA synthesis during viral replication . templates or by their cleavage into secondary siRNAs. signal complex which is between 27 and 54 kDa . ss- or dsRNA, which is typically a hairpin (hp) RNA. cumulated to cause systemic silencing . have been involved in carotenoid metabolic pathway. in plant nuclei using the host DNA replication machinery. ogy-dependent systemic silencing of endogenous genes. plants in the future by taking advantage of this approach. 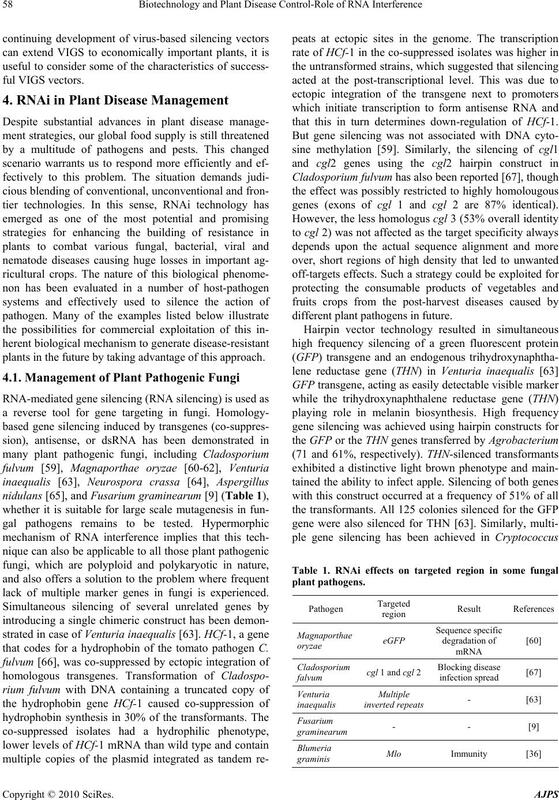 lack of multiple marker genes in fungi is experienced. that codes for a hydrophobin of the tomato pathogen C.
that this in turn determines down-regulation of HCf-1. genes (exons of cgl 1 and cgl 2 are 87% identical). different plant pathogens in future. enhanced green florescent protein gene as a model . polyketide synthase-like genes was also developed . duction, but not a complete loss of, in gene expression. that genes other than those targeted might be silenced. was moderately affected by ABA, JA and SA treatment. cause visible developmental changes in rice plants. report to manage a major bacterial disease through RNAi. plants which are susceptible to crown gall tumorigenesis. bacterial titer by 5-fold . long dsRNA and siRNA without size specificity . through micro RNA binding in a dose dependent manner. heterologous viruses as well . mechanism for protecting plants from nematode damage. feeding nematode to incapacitate or kill it. knot nematode species (Table 3). inducing dsRNA uptake by second stage juvenile of M.
cific as well as technologically facile and economical. constructs (binary vectors and sense and antisense genes). mascotous intruders of crop plants. on Power Delivery, IEEE, Vol. 19, No. 2, April 2004, pp. rica, Vol. 49, 2002, pp. 1-14. D. Hoisington, M. Khairallah, T. Reeves, J. M. Ribaut, B.
of Sciences of the USA, Vol. 96, 1999, pp. 5937-5943. Academy of Sciences of the USA, Vol. 95, 1998, pp. Nicotiana sylvestris,” Plant Physiology, Vol. 99, 1992, pp. Plant Sciences, Vol. 21, 2002, pp. 167-204. Vol. 5, 2002, pp. 323-329. Societies Letters, Vol. 579, 2005, pp. 5950-5970. 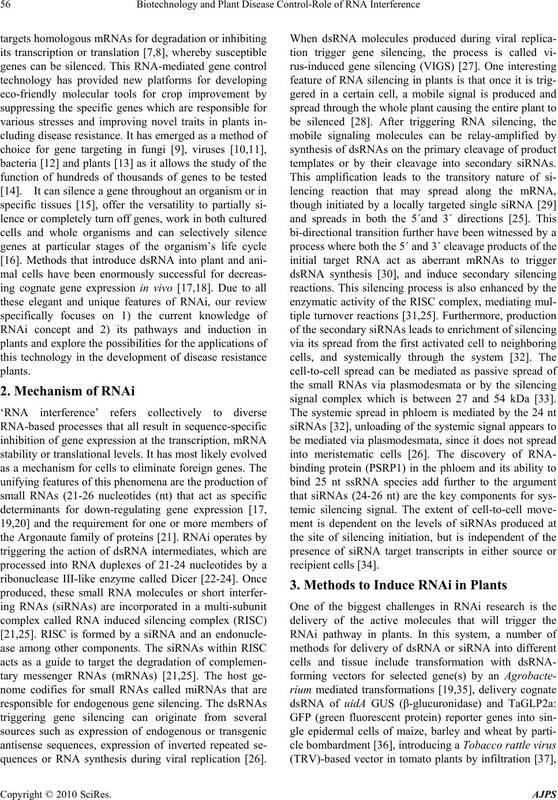 D. C. Baulcombe, “RNA silencing in Plants,” Nature, Vol. Biologicae, Vol. 2, 2010, pp. 20-28.
ceedings of the National Academy of Sciences USA, Vol. Silencing Pathways in Plants,” Trends in Genetics, Vol. M. R. Godge, A. Purkayastha, I. Dasgupta and P. P.
Biotechnology, Vol. 22, 2005, pp. 443-446.
views, Vol. 55, 2003, pp. 629-648.
ture, Vol. 411, 2001, pp. 834-842. Vol. 404, 2000, pp. 293-296. A. Fire, S. Xu, M. K. Montgomery, S. A. Kostas, S.
elegans,” Nature, Vol. 391, 1998, pp. 806-811. E. Bernstein, A. A. Caudy, S. M. Hammond and G. J.
bott, P. A. Stoutjesdijk, S. P. Robinson, A. P. Gleave, A.
Plants,” Plant Journal, Vol. 27, 2001, pp. 581-590. Genes and Development, Vol.17, 2003, pp. 49-63. Vol. 579, 2005, pp. 5858-5871. 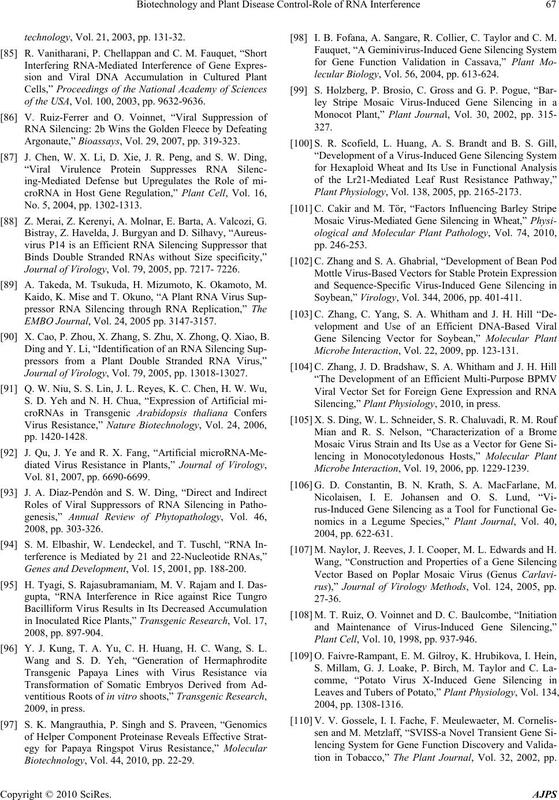 Plants,” Methods, Vol. 30, 2003, pp. 296-303. P. Dunoyer, C. Himber, V. Ruiz-Ferrer, A. Alioua and O.
ture Genetics, Vol. 39, 2007, pp. 848-856. Academy of Sciences of the USA, Vol. 99, 2002, pp. Vol. 297, 2002, pp. 2056-2060. Journal, Vol. 50, 2007, pp. 597-604. Vol. 31, 2002a, pp. 777-786. Cell, Vol. 12, 2000, pp. 369-380. W. Tang, D. A. Weidner, B. Y. Hu, R. J. Newton and X. 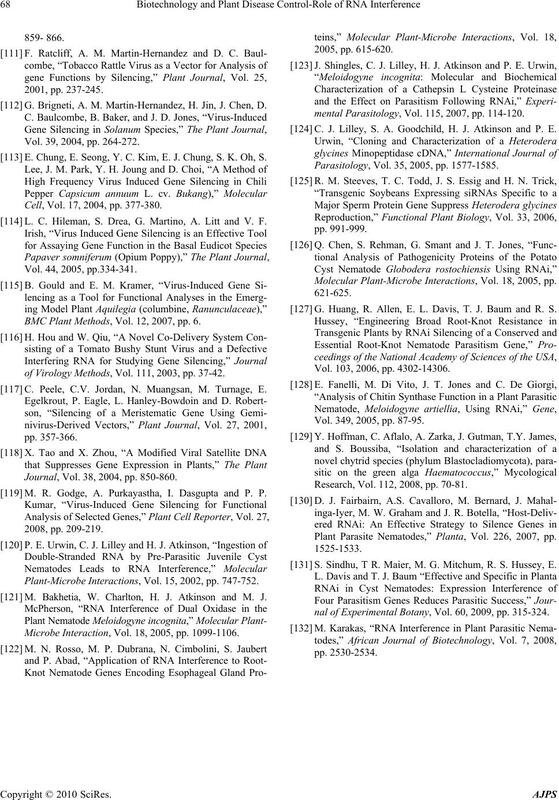 Post Transcriptional Gene Silencing,” Plant Science, Vol. Plants, Springer-Verlag, Berlin, 2007, pp. 123-147. Plant Physiology, Vol. 126, 2001, pp. 930-938.
against Viruses,” Trends in Genetics, Vol. 17, 2001, pp. S. Mlotshwas, O. Voinnet, M. F. Mette, M. Matzke, H.
Cell, Vol. 14, 2002, pp. 289-301. F. Tenllado, B. Martinez-Garcia, M. Vargas and J. R.
tion,” BMC Biotechnology, Vol. 3, 2003, pp. 3-14.
pathology, Vol. 40, 2002, pp. 45-74. Vol. 92, 1995, pp. 1679-1683. 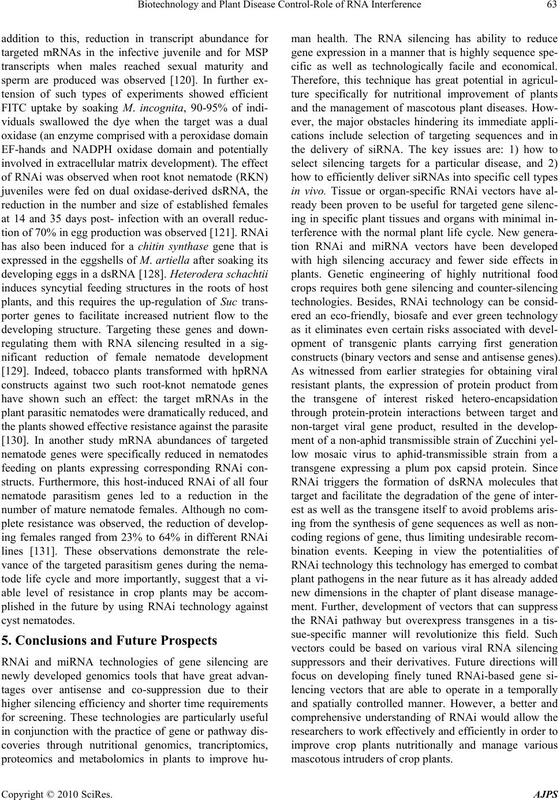 Genes,” The Plant Journal, Vol. 20, 1999, pp. 357-362. Vectors,” Virology, Vol. 267, 2000, pp. 29-35. Biotechnogy, Vol. 20, 2002, pp. 622-625. Physiology, Vol. 129, 2002c, pp. 1732-1743. M. A. Turnage, N. Muangsan, C. G. Peele and D.
Microbiology, Vol. 65, 1994, pp. 205-209.
eral Virology, Vol. 82, 2001, pp. 1239-1243.
and General Genetics, Vol. 259, 1998, pp. 630-638. J. 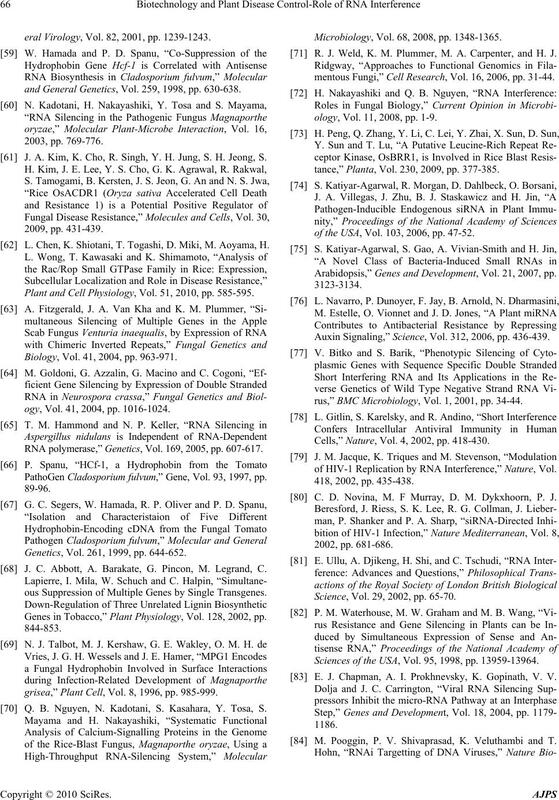 A. Kim, K. Cho, R. Singh, Y. H. Jung, S. H. Jeong, S.
 L. Chen, K. Shiotani, T. Togashi, D. Miki, M. Aoyama, H.
Plant and Cell Physiology, Vol. 51, 2010, pp. 585-595. Biology, Vol. 41, 2004, pp. 963-971.
ogy, Vol. 41, 2004, pp. 1016-1024. 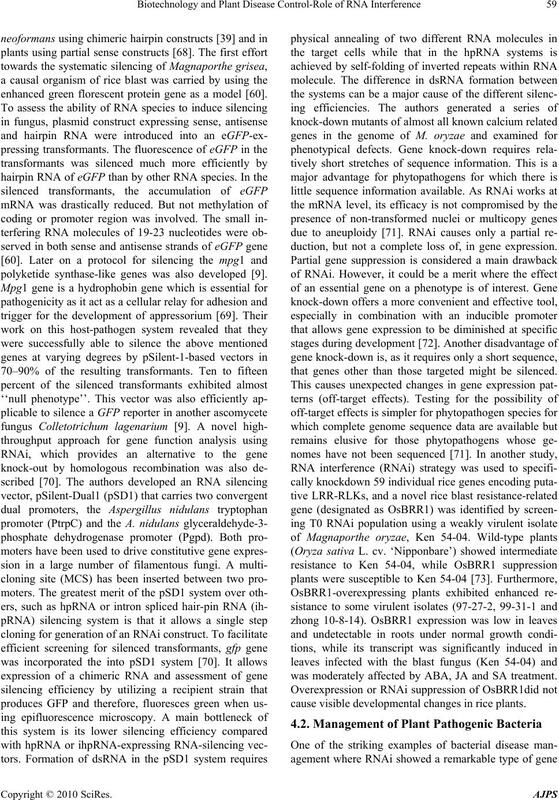 RNA polymerase,” Genetics, Vol. 169, 2005, pp. 607-617. PathoGen Cladosporium fulvum,” Gene, Vol. 93, 1997, pp. Genetics, Vol. 261, 1999, pp. 644-652. J. C. Abbott, A. Barakate, G. Pincon, M. Legrand, C.
ous Suppression of Multiple Genes by Single Transgenes. 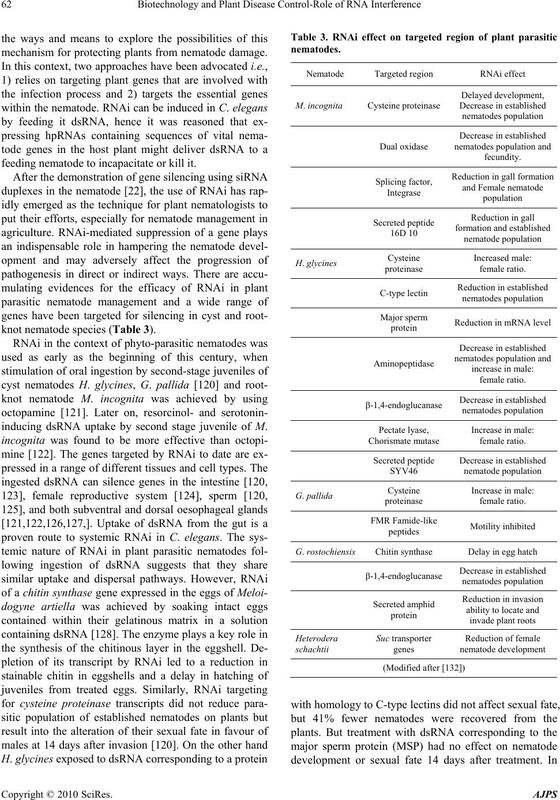 Genes in Tobacco,” Plant Physiology, Vol. 128, 2002, pp. grisea,” Plant Cell, Vol. 8, 1996, pp. 985-999. Q. B. Nguyen, N. Kadotani, S. Kasahara, Y. Tosa, S.
Microbiology, Vol. 68, 2008, pp. 1348-1365. R. J. Weld, K. M. Plummer, M. A. Carpenter, and H. J.
mentous Fungi,” Cell Research, Vol. 16, 2006, pp. 31-44.
ology, Vol. 11, 2008, pp. 1-9.
tance,” Planta, Vol. 230, 2009, pp. 377-385.
of the USA, Vol. 103, 2006, pp. 47-52. Arabidopsis,” Genes and Development, Vol. 21, 2007, pp. Auxin Signaling,” Science, Vol. 312, 2006, pp. 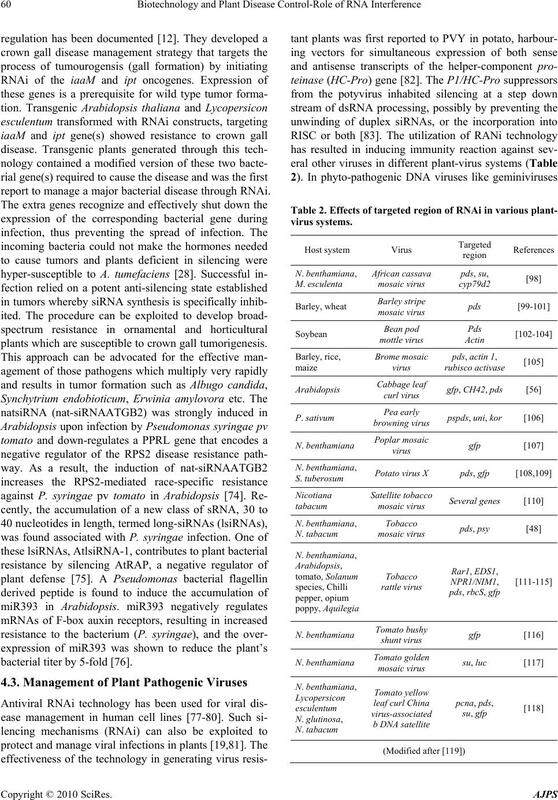 436-439.
rus,” BMC Microbiology, Vol. 1, 2001, pp. 34-44. Cells,” Nature, Vol. 4, 2002, pp. 418-430.
of HIV-1 Replication by RNA Interference,” Nature, Vol. C. D. Novina, M. F Murray, D. M. Dykxhoorn, P. J. Science, Vol. 29, 2002, pp. 65-70. Sciences of the USA, Vol. 95, 1998, pp. 13959-13964. E. J. Chapman, A. I. Prokhnevsky, K. Gopinath, V. V.
 M. Pooggin, P. V. Shivaprasad, K. Veluthambi and T.
technology, Vol. 21, 2003, pp. 131-32.
of the USA, Vol. 100, 2003, pp. 9632-9636. Argonaute,” Bioassays, Vol. 29, 2007, pp. 319-323. No. 5, 2004, pp. 1302-1313. Z. Merai, Z. Kerenyi, A. Molnar, E. Barta, A. Valcozi, G.
Journal of Virology, Vol. 79, 2005, pp. 7217- 7226. 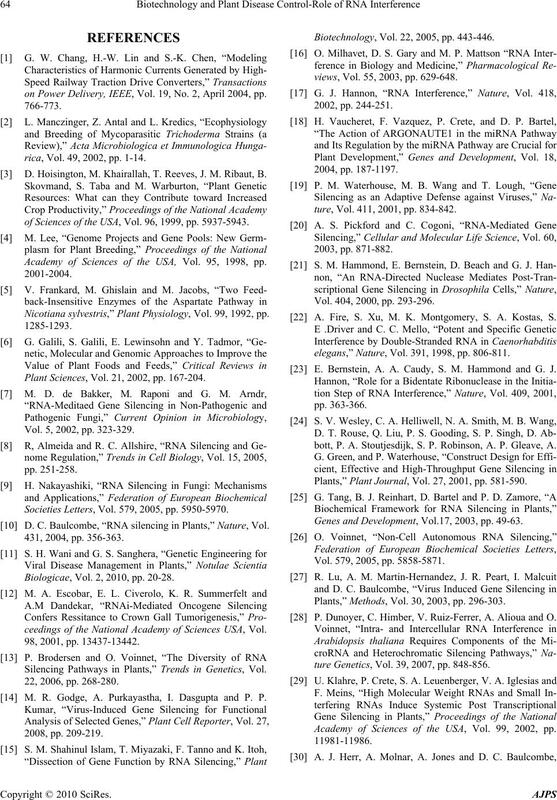 A. Takeda, M. Tsukuda, H. Mizumoto, K. Okamoto, M.
EMBO Journal, Vol. 24, 2005 pp. 3147-3157. X. Cao, P. Zhou, X. Zhang, S. Zhu, X. Zhong, Q. Xiao, B. Journal of Virology, Vol. 79, 2005, pp. 13018-13027. Vol. 81, 2007, pp. 6690-6699. Genes and Development, Vol. 15, 2001, pp. 188-200. Y. J. Kung, T. A. Yu, C. H. Huang, H. C. Wang, S. L.
Biotechnology, Vol. 44, 2010, pp. 22-29. I. B. Fofana, A. Sangare, R. Collier, C. Taylor and C. M.
lecular Biology, Vol. 56, 2004, pp. 613-624. Plant Physiology, Vol. 138, 2005, pp. 2165-2173. Soybean,” Virology, Vol. 344, 2006, pp. 401-411. Microbe Interaction, Vol. 22, 2009, pp. 123-131. 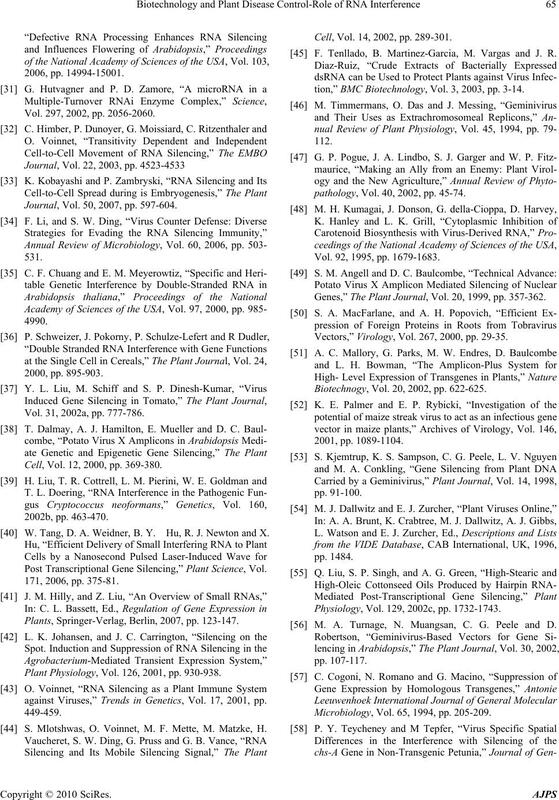 Silencing,” Plant Physiology, 2010, in press. Microbe Interaction, Vol. 19, 2006, pp. 1229-1239. G. D. Constantin, B. N. Krath, S. A. MacFarlane, M.
 M. Naylor, J. Reeves, J. I. Cooper, M. L. Edwards and H.
rus),” Journal of Virology Methods, Vol. 124, 2005, pp. Plant Cell, Vol. 10, 1998, pp. 937-946.
tion in Tobacco,” The Plant Journal, Vol. 32, 2002, pp. G. Brigneti, A. M. Martin-Hernandez, H. Jin, J. Chen, D.
Vol. 39, 2004, pp. 264-272. E. Chung, E. Seong, Y. C. Kim, E. J. Chung, S. K. Oh, S.
Cell, Vol. 17, 2004, pp. 377-380. L. C. Hileman, S. Drea, G. Martino, A. Litt and V. F.
BMC Plant Methods, Vol. 12, 2007, pp. 6.
of Virology Methods, Vol. 111, 2003, pp. 37-42. C. Peele, C.V. Jordan, N. Muangsan, M. Turnage, E.
Journal, Vol. 38, 2004, pp. 850-860. Plant-Microbe Interactions, Vol. 15, 2002, pp. 747-752. M. Bakhetia, W. Charlton, H. J. Atkinson and M. J. Microbe Interaction, Vol. 18, 2005, pp. 1099-1106.
mental Parasitology, Vol. 115, 2007, pp. 114-120. C. J. Lilley, S. A. Goodchild, H. J. Atkinson and P. E.
Parasitology, Vol. 35, 2005, pp. 1577-1585. Molecular Plant-Microbe Interactions, Vol. 18, 2005, pp. G. Huang, R. Allen, E. L. Davis, T. J. Baum and R. S.
Vol. 103, 2006, pp. 4302-14306. Vol. 349, 2005, pp. 87-95. Research, Vol. 112, 2008, pp. 70-81. 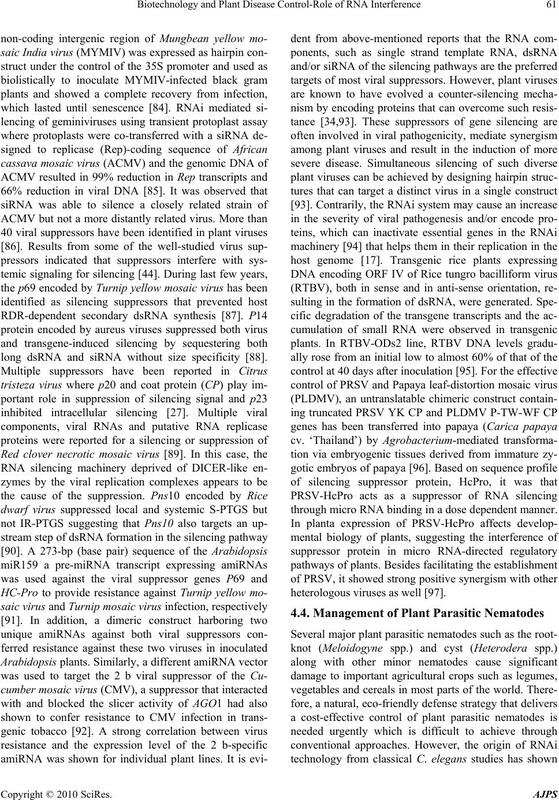 Plant Parasite Nematodes,” Planta, Vol. 226, 2007, pp. S. Sindhu, T R. Maier, M. G. Mitchum, R. S. Hussey, E.
nal of Experimental Botany, Vol. 60, 2009, pp. 315-324.